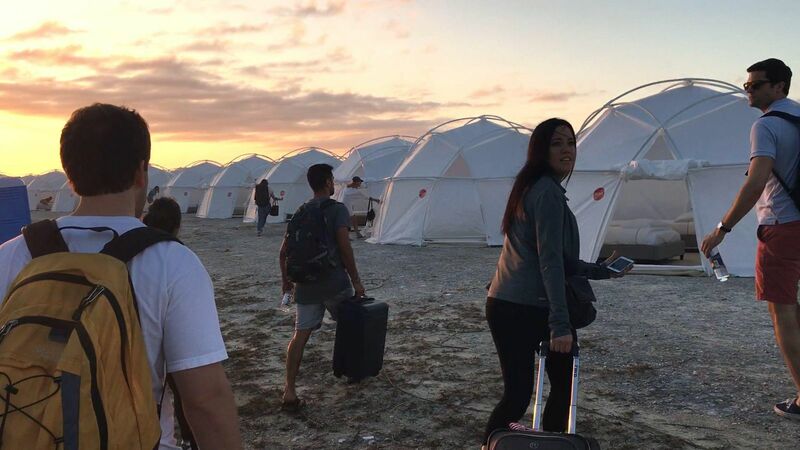 If you don’t believe in the evils of capitalism already, watch the new Netflix documentary on Fyre Festival, and you soon will. A team of men embark on the quest of throwing the greatest, most indulgent party of all time – and among fraud and false advertising, it’s an epic flop of dangerous, illegal proportions. But what many have failed to point out is way the commercial fiasco plays out is at its heart, a story of race and gender. Almost all the people involved with this catastrophe – marketing, managing, organising – are white, western men. And what the documentary captures most is how their privilege works. How it forgives and forgets, how it wins confidence, projects competence and, most importantly, makes money. The dynamics of the festival are deeply troubling: a group of white men symbolically “colonising” a Caribbean island, enlisting local labourers, and not paying them. Considering, too, the weird fetishism of populating an exotic island with white supermodels and American millionaires, the whole affair speaks to a larger frightening fantasy of conquest, indulgence and gluttony. Perhaps unwittingly, the documentary is an alarmingly accurate exposé of everything wrong with the international matrix of privilege and oppression, but also a fascinating insight into how wealthy white men understand themselves and others. Capitalism is the name of the game for these men. From the start of the programme, the word “entrepreneur” is thrown around to refer to our protagonist, Billy MacFarlane, with a tone verging on adulation. In this world of sports cars, supermodels, and jets, money is the means, the ends, and the ideology. Capitalism is their belief system; a perverted moral order under which virtually anything is excusable in the pursuit of profit. Billy is an icon to his entourage because of his ability to secure investment. He is the money whisperer, an inspiration, “one of the world’s greatest salesmen,” according to colleagues. The real-world consequences are detached from the fantasy game being played. The paying guests, the Bahamians, even the employees in New York, aren’t a part of this vision. The dream is about cracking the magic formula: making money without making a product. As part of this adventure, these men also take the opportunity to enlist a cohort of almost exclusively white models and Instagram influencers to endorse the festival. The promotion footage consists of tall, lithe white women posing in bikinis, splashing in the waves, lounging on yachts; enticing other rich white men to depart with thousands of dollars just to spend time with them. And to give credit where it’s due, these marketing men know what they’re doing. They are selling a fantasy that speaks to the desires of their audience. What could be better than a tropical island, populated with beautiful, white, voiceless supermodels partying whilst a homely Caribbean matron serves you a piña colada? This sales pitch speaks to the not-so-innermost desires of white male imagination: the objectification of white women, the consumption of the exotic, the servitude of brown bodies and a sense of belonging, of anywhere being “yours for the day” for the right price. The documentary exposes how these men understand their relationship with others. Their devaluation of black labour, their disregard for the consumer and their disinterest in women in any capacity beyond marketing potential. It also illustrates the curious relationships between the men themselves. Ja Rule occupies an interesting space; being black, he still lusts after white women and buys into the ideology of capitalism. And yet, all the business people are white. The designers, marketing consultants, and organisers have odd fraternal – verging on paternal – relationships with Billy. Between one another they express feelings of envy, resentment and admiration. Andy King in particular reiterates how he knew Billy as a young man. He seems to consider himself a mentor; a veritable “you remind me of myself” situation. These masculine environments seem to foster such intense misplaced loyalties between the men, wherein there is no room to speak out for fear of “betraying a brother” or “making problems when we need solutions,” a favourite phrase of Billy’s when firing defiant employees. The structure of the programme falls into the trap of predominantly giving ownership of the narrative to these very men and, not surprisingly, the narrative is one of victimhood. The privilege of their whiteness, maleness, and wealth has absolved them of any shame as they reposition themselves as victims. They embody the dynamics of racism, sexism and neo-imperialism at play in international capitalism and expose how “success” is often built on the exploitation of oppressive power structures. For the white men of the world to prosper, women’s bodies are reduced to marketing tools. The “hilarious” story closes. A Bahamian woman loses her life’s savings. Black labour goes unpaid.